Why do we exist? What is the supreme purpose of mankind? To glorify God (fear Him and obey Him) and enjoy Him forever! We will begin a sermon series through the book of Ecclesiastes on August 26. This sermon series will take us on Solomon’s journey to his conclusion regarding our true and only purpose in life! The conclusion of the matter is that the meaning of life is to “fear God and keep his commandments, for this is the whole duty of man.” (Eccl. 12:13). 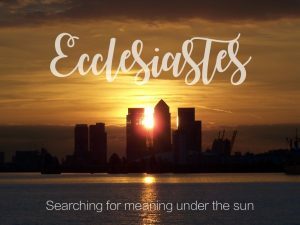 The whole book of Ecclesiastes is driving toward this conclusion, and this theme weaves its way through Solomon’s entire work.